Age: 5-12 years Enter the world of Ancient Egypt, the land of the pharaohs, where your child will go on a quest to unravel clues and save the ancient treasures of Tutankhamun. This educational story is filled with mystery and suspense. A personalised tale guaranteed to grip young readers while they learn about this period in Egyptian history. Book description : 30 pages, size: 25 cm x 20 cm, with thick high quality paper, using professional digital printing, and a laminated cover. Age:5-12 years Enter the world of Ancient Egypt, the land of the pharaohs, where your child, the prince or princess, will go on a quest to unravel clues and save the treasures of Tutankhamun. Dad takes the role of Pharaoh, ruling the ancient world with Mum as queen. When a mischievous monkey, a royal family and a couple of greedy thieves get together, ordinary life ends for the entire family. This educational story is filled with mystery and suspense, giving young readers such a thrilling adventure that they won’t notice that they are learning along the way. This important period of Egyptian history is enlivened by illustrations as magical as the era itself. Personalisation : The photo of the child appears 12 times and the name 10 times. The photo of the parents appear 5 times, and their names twice. There is also an option to create your own personalised message to the child, that appears at the beginning of the book. Land of the Pharaohs A breath-taking adventure story with your child as the star keeps her amused while she learns all about ancient worlds. When learning is fun, children remember more of what they read, making this the ideal way to encourage a passion for history. Enter the world of Ancient Egypt, the land of the pharaohs, where your child will go on a quest to unravel clues and save the ancient treasures of Tutankhamun. This educational story is filled with mystery and suspense. 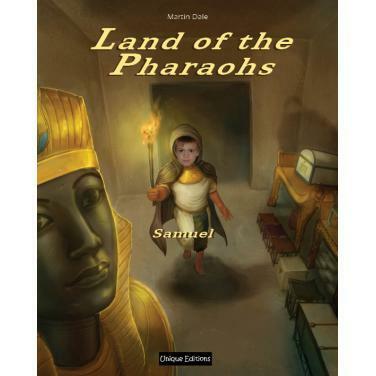 A personalised story book guaranteed to grip young readers while they learn about this period in Egyptian history. When a child is given a book in which she is the star of the show, her excitement can almost be tasted. The study found that one of the most effective ways to spark a hunger for reading is to give children stories that are relevant to them. Because the child has the reference point of her own life, she can make better sense of the story. She can understand it better because the events are unique to her ethnicity, gender and social background. Relevance is the first building block of learning and excitement is the best foundation for a love of reading.